What are the odds? 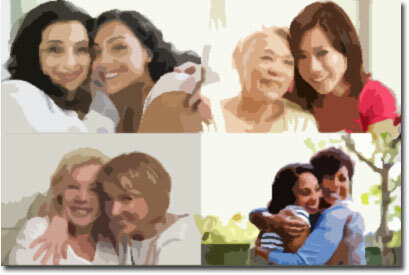 Within a very short period of time, I experienced three sessions involving mother/daughter healings. if you see or experience something multiple times like passing five white cars in a row, or different crows cawing at you along a walk, stop and take note. Ask: “what’s the message here?” Then just listen inward. So here I am, paying attention to just such an occurrence. What does it mean? Well first let me briefly describe the sessions to you. An intuitive friend was helping me work through a personal issue about “pride”. In the middle of the reading my paternal grandmother came in as well as my aunt (my grandmother’s first born daughter). It seems this issue was passed down through a couple of generations. As part of the reading, we helped my grandmother and aunt heal their relationship. At the end, they hugged and waved back at me, smiling. Beautiful. While doing a reading for a woman at a fair, the woman’s deceased mother and grandmother came through. Even though only the mother was requested and expected, the grandmother decided to come in as well. The mother sat in a chair, while the grandmother (the seated woman’s mother) stood behind her with her hands firmly on her seated-daughter’s shoulders. I could feel how controlling the situation looked. In checking in with them, I received guidance to help them heal their relationship. Amazingly, just acknowledging that they needed a healing started the healing process. At the end, they both stood up, hugged, and waved back at us, smiling. During a Family Constellation Therapy session, I volunteered to be a participant to help a friend who wanted to receive some insights and guidance regarding her family. Without going into details about what happened, I can share that we witnessed a three-generation mother-daughter healing: grandmother and mother, then mother and daughter. At the end, my friend received a dramatic understanding regarding the women in her family and how best to move forward. Very powerful. First let me say, I feel very blessed to have done a lot of healing work over the years with my relationships with my mother and with my grandmother. About half the healing work with my mom, happened while she was still alive, the rest after she passed. For my grandmother, it was ALL done after she passed. Going through these recent sessions helped remind me of this blessing. Since energy is energy, healings can happen beyond our earthly, 3D existence. Healings can occur in an instant, in an afternoon, or in whatever timeframe it needs; let go of judging how long it takes. Sometimes the healing requires little, if any, action on our part; we just need to be ready to welcome them when they are ready to come forward. Some of our issues that we believe are our own, really belong to others, inherited from previous generations who had yet to heal from them. Let go of the idea that healing appears to condone hurtful, dysfunctional behavior. In reality, healing is coming to terms with “what is”, understanding where it came from, finding peace within ourselves, and letting go of the rest. Now more than ever, in this time of #MeToo and #TimesUp, women are in need of feeling empowered, to heal that part of themselves that feels wounded and held back. And what better way than with our moms and daughters happily by our side. BTW…If you ever have the chance to be part of a Family Constellation session, I highly recommend it. Pain travels through family lines until someone is ready to heal it in themselves. By going through the agony of healing, you no longer pass the poison chalice onto the generations that follow. It is incredibly important and sacred work.